Dr. Paczolay was elected Judge of the Constitutional Court by Parliament in February 2006, he entered into office on 24 February 2006. Since 4 July 2008, he has been the President of the Constitutional Court. He graduated from the Faculty of Law and Political Sciences of Eötvös Loránd University, Budapest in 1980. After working as a legal adviser, he lectured at the Department of the Philosophy of Law from 1983 to 1990 and from 1990 to 2005 at the Department of Political Sciences at the Faculty of Law and Political Sciences of Eötvös Loránd University, Budapest. Since 1992 he has been Head of Department of Political Sciences at the Faculty of Law and Political Sciences of József Attila University of Szeged (at present University of Szeged). Between 1994 and 1998 he was Vice-Dean of the Faculty. On 1 January 1990 he became chief counsellor to the Constitutional Court and from November 1996 he worked as Secretary General of the Court. From August 2000 he was Deputy Head, from August 2005 Head of the Office of the President of the Republic of Hungary. He was elected Judge of the Constitutional Court in February 2006 and he was Vice-President of the Court from March 2007 to July 2008. The plenary session of the Constitutional Court elected him President on 4 July 2008 for three years. 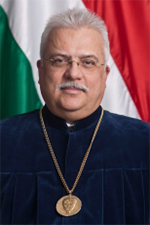 On 4 July 2011 the Hungarian Parliament – for the period of his mandate as Constitutional Judge – elected him as President of the Court. He obtained his candidate’s degree in 1989 and he qualified as a university lecturer in 1999. He was granted full professorship in 2000. He teaches theory of State, legal theory, political sciences, history of political thought, federalism and constitutional justice. In 1991-92 he was research fellow at Woodrow Wilson International Centre for Scholars in Washington, DC. His main fields of research are theory of the State, comparative constitutional law and history of political theories. In 2002 he was elected member of the European Academy of Sciences and Arts (Salzburg). Since 2005, he has been member of the Venice Commission of the Council of Europe. Between 2009 and 2011 he was Vice President of the Venice Commission, in October 2013 he was elected as Honorary President.